Dips existed for centuries, but became popular in the USA only in 1950s. Celebrate National Chip and Dip Day on March 23 by making a chip and dip party. The first dips that are known to food historians are olive oil and hummus. These two dips originated in Mediterranean and Middle Eastern regions. Although these dips are centuries old, they are still popular today. Modern dips include guacamole, salsa, cheese. And if you have no time to make a special dip, you can use simple mayo or ketchup. Dip goes well with any kind of chips: tortilla, potato, corn chips. Even pretzels are great with savory dip. But this kind of dish wasn't popular in the United States before the end of 1940s. 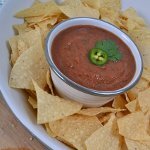 After the Great Depression lots of middle class families couldn't afford expensive food, that is why cheep and easy-to-make dips and chips became the go-to party dishes. Did you know that the first chip-and-dip set was made by glass? This two-bowl set was advertised as useful not only for potato chips, but also for salads and seafood snacks.